Let’s see the features of these editions in detail. Enterprise edition in 2014 is the full featured edition of all the editions. The other editions will have some limitations in these features. The major features includes. Enterprise edition has no limitation of processor cores. It can use all the processors the server has. There is No limitation of memory utilization per instance either. Maximum database size is 524 PB. It has advanced data integration technique (Fuzzy grouping and lookup, change data capture). In-memory OLTP, the Microsoft’s newest in-memory optimization technique is available only in the enterprise edition of SQL Server 2014. Apart from this, it has all the features available in the business intelligence edition. The enterprise edition is priced in per core licensing model. As of today, per core costs US$14,256. The Business Intelligence edition can use up to 16 processor cores. An instance can use the servers memory up to 128 GB. Just like the enterprise edition, A database can grow up to 524 PB. One among the highlights of business intelligence edition which is also available in the enterprise edition is the Self-service business intelligence option includes (Alerting, Power View, Power Pivot for Share Point Server, and so on). This edition also includes the Advanced corporate BI (Tabular BI semantic model, advanced analytics and reporting, in-memory analytics engine and advanced data mining). Just like Business Intelligence edition, the standard edition also supports up to 16 processor cores. Maximum memory use is limited to 128 GB. A database can grow up to 524 PB. It does not have the business intelligence modules or the advanced features available in enterprise edition. Standard edition is priced in per core licensing model. Per core costs US$3,717. Web edition is the cost-effective edition of the SQL Server database especially for web site hosting. Supports up to 16 processor cores. Each instance can use the memory of the server up to 64 GB. Just like the above mentioned editions, a database can grow up to 524 PB. Just like standard edition web edition also does not have the business intelligence modules or the advanced features available in enterprise edition. Price: The web edition is not available to be purchased by the public. It is available only for the hosting providers. Microsoft have not disclosed the price for the web edition. Developer edition has the same features as in Enterprise Edition. But limited by license to be used for development, testing and demonstration purpose. Developer edition is not licensed to use in production environment. Price: From March 31, 2016 the developer edition is free of cost. Previously there was a small price of around $50 per developer license. 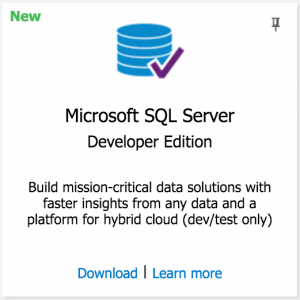 See this article for the step by step installation guide for SQL Server Developer Edition. Express edition is a free and light weight edition of SQL Server with various limitations. This is the entry-level database edition. Supports up to 4 processor cores. Memory use is 1 GB per instance. The maximum size of a database can be 10 GB. No SQL Agent for automatic backups. Unlike developer edition this edition can be used for production. Helpful for small applications which use less data. Features supported by the Editions of SQL Server 2014. SQL Server Price Details in How to buy SQL Server. ← SQL Server Editions – Enterprise, Standard, etc.